Sometime in the past forty years, I'm certain I came across a reliable source that documented Dakube as meaning Pretty Place in the Applegate/Galice dialect of the Athapaskan language. Though I have searched and searched through my personal library and archives, the only reference I have found so far is to Ta'kopee in the 1933 field notes of J.P. Harrington. He writes that "Inds. used to say it was such a pretty place." Harrington doesn't exactly nail down the literal meaning, does he? That's unusual. He's usually pretty precise. There are other sources that mention the name, but only that it refers to the river itself, or the mouth of the river where it flows into the Rogue. Not what the word means. At this point, the only thing I haven't done is perused the thousands of pages of my own field notes. There's a chance that an elder I talked with years ago mentioned it, and I scribbled it into a notebook. In the world of local linguistics, Ta'kopee and Dakube are the same word written in different linguistic systems. J.P. Harrington heard a T and Edward Sapir heard a D, with the actual sound in the native language somewhere in-between, a sound we don't make in English. Same problem with a P and a B, a K and a G, and so on.... Thus we see written: Takelma and Dagelma. They refer to the same people and both are correct. To make matters a little more confusing, I use both systems. I usually choose whichever version is the one most folks are used to hearing or reading. So I write our Salmon Ceremony village name as Ti'lomikh instead of Dilomi, and the giant Dragonfly in our Takelma myths is Daldal rather than Taltal. 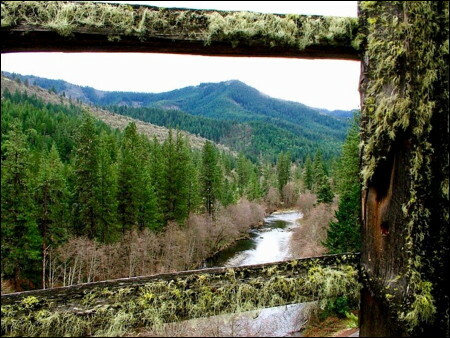 I've been writing an original native story called "Dakubetede" set in the Applegate River region of southern Oregon. In introducing the title I did a little storyteller kind of sidestep, which more or less got me off the hook with my more strict historian friends. Since they can't figure it out either, I got away with it. I wrote: "The Old Ones call this river Dakube. They say the name means Pretty Place, and they stretch the name to include themselves: Dakubetede, People of the Pretty Place. Some linguists say this translation is shaky, but many folks like it and want to believe it is true. And so it is." And indeed, for the past few decades, locals have been calling Applegate Indians, the Dakubetede, though I suspect that most people don't know what it means. But it does fit well into the pattern of native names. Takelma (People of the River, or the River's People) and Dakubetede (People of the Pretty Place). I'll continue to search for that source, but for now it remains elusive. While I enjoy a mystery, I dislike a muddle. If anyone wants to toss me a clue, I'd love to be enlightened. Afterword. Soon after I wrote this essay, a friend reminded me that Toke-tie (also spelled Toketee as in Toketee Falls) is a Chinook Jargon word meaning pretty, and is from the Kalapuya language in the Willamette Valley of Oregon. Kalapuyan is part of the Penutian family of languages -- not Athapaskan like Applegate/Galice. Toke-tie, Ta'kopee and Dakube are pretty close. Does this mean that on one of their trading trips to the Columbia River, the Applegate Indians introduced themselves to the Kalapuyans as the Dakubetede? Or maybe Kalapuya folks were talking among themselves, "Those people from down south are always saying they're from a pretty place so maybe that's what we ought to call them." The plot thickens, and this muddle is a bit more muddy. Another Afterword. 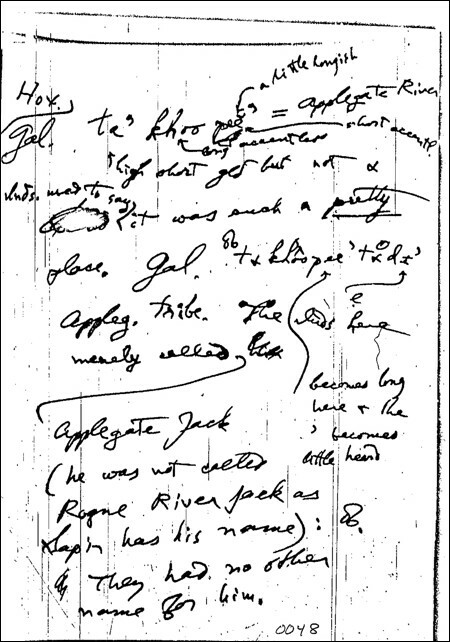 A few months after writing this piece, I came across a stack of notes J. Owen Dorsey had put together as he was writing an article for the Journal of American Folk-lore. One of the maps clearly showed Dakubetede, though it wasn't included in the final article. In the same notes was an entry for the name. At least now I know the name was in use as early as the late 1800s. 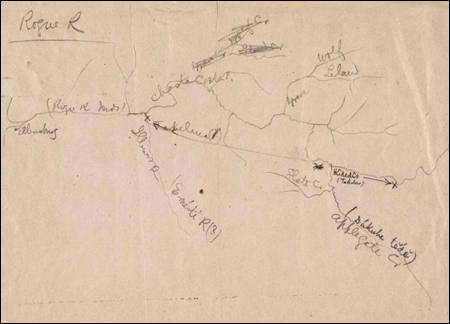 The images show the page in Harrington's field notes that refers to Ta'kopee, two images from J. Owen Dorsey's 1884 notes, and a view of the Applegate River.